I touched lightly on these shoes in yesterday's outfit post. Today I finished rearranged and finished the revamp that had entered my mind yesterday. See all the photos after the jump. These faux-suede Xhileration oxfords are from Target. I picked them up a little less than a year ago and I really love them for fall and spring. They're comfy, and breathable — not to mention I got 'em on sale for about seven dollars. Ever since I bought my Big Buddha Rylee oxfords, though, I had neglected these. The Rylees are so universal that I kind of forgot about these softies. 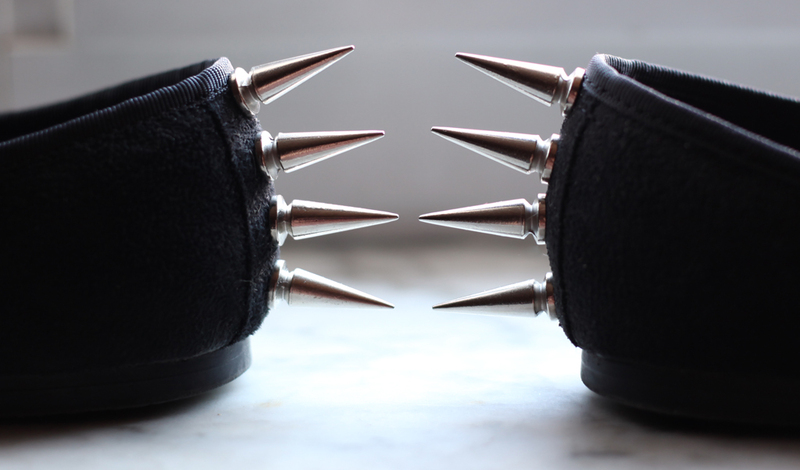 I recently found a couple of cone-spike "Hot Topic-esque" bracelets at the thrift store and decided to use the studs to make some sassy shoes! 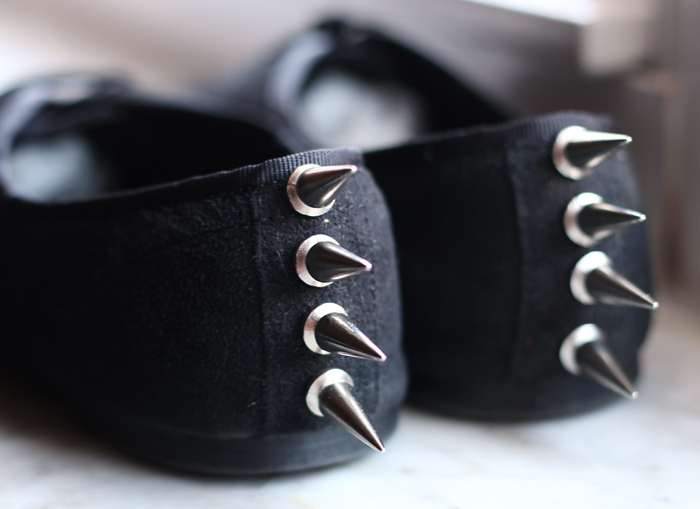 Yesterday I had simply inserted the spike studs through the lace eyelets. I removed the laces and wore them around loosey-goosey (which I don't necessarily mind). My original idea, though, was to have the studs through the heel. I took apartment yesterday's progress and created four heels in the heel of each shoe. then I screwed the studs in place. I think they're wonderful! What do you think? What's your favorite way to refashion your old shoes?